Lost on a mazelike series of remote country roads at night, a young couple discovers that they are being stalked. After dating for just two weeks, Tom invites Lucy to go with him and some friends to a festival. The night before, Tom plans to take Lucy to the Kilairney House Hotel, which is hidden away on a series of remote roads in the Irish countryside. Before making their way to the hotel, the couple stops at a pub and a confrontation occurs between Tom and some of the locals. On the empty back road to the hotel, Tom and Lucy find themselves going in circles despite following the signs. They eventually realize that they keep returning to the same point no matter which paths they take and they are unable to find their way back to the main road. Strange things begin happening, including Lucy spotting a man in a white mask and someone attempting to grab her from the darkness. While speeding down the road away from their attacker, Tom clips a man in the road. He and Lucy pick up the man, who says his name is Max. Max claims to be under attack by the same people stalking the couple, however, he is eventually revealed to be the true culprit. Tom kicks Max out of the car following a harrowing confrontation and Max breaks Tom’s wrist in a subsequent fight. Lucy and Tom take their flashlights and search the woods when their car runs out of gas. Someone grabs Tom from the darkness and Tom disappears. Lucy returns to the car alone and finds a gas can in the front seat. After refilling the tank, Lucy drives on and eventually finds the hotel, but she discovers that it is abandoned. The parking lot is a graveyard of derelict cars, suggesting that she and Tom are not the first victims. Max returns in a truck and pursues Lucy. When Lucy is able to stop the car, she finds a tube running from the exhaust pipe into the trunk. Lucy pops the trunk and discovers Tom bound inside, dead from the tube of carbon monoxide shoved into his throat. As day breaks, Lucy returns to the road and sees Max standing in the distance. Max outstretches his arms and smiles at her. Lucy slams her foot on the pedal and accelerates towards Max. Since its debut at Sundance in 2013, “In Fear” has garnered poster-worthy praise like “chilling,” “instant classic,” and “one of the best horror movies of the year.” It is entirely possible that I might have had a similar opinion, had I not been so thoroughly distracted by how utterly grating the central personalities are. My one-word sound bite to describe “In Fear?” Annoying. Where “In Fear” fails as an engaging horror film, it succeeds as a primer for coaching young men on how not to behave when dating. Iain De Caestecker, known to TV viewers as the male half of Fitzsimmons on “Marvel’s Agents of SHIELD,” plays Tom, an absolute tool who is not even written to be one necessarily, but comes across as a natural asshat. Tom has been dating Lucy for two weeks. On the eve of some sort of festival they are attending with friends, Tom has the not-so-bad idea of taking Lucy to a secluded hotel hidden in the Irish countryside. If films like “Vacancy” and “Psycho” have taught anybody anything, it is that out of the way mom and pop motels are nearly always dens of sadistic depravity and a good place to end up as featured players in a scary movie. Tom and Lucy don’t have the chance to find that out firsthand, however. On the twisty, unpaved paths that are supposed to lead to the hotel, the couple follows marked signs only to end up right where they started, which is completely lost. No matter what route they take or which turns they make, Tom and Lucy find themselves further and further away from a way out. 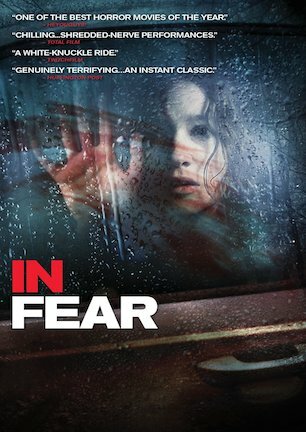 “In Fear” aims for sympathetic claustrophobia and fear of the dark terror as the audience spends 80 minutes confined in the car with Tom and Lucy. Unfortunately, the perpetual frustration with how stupid everyone behaves promptly erects a brick wall between the viewer and any invested care about what might happen to the doomed pair. Tom has zero charm whatsoever. The backstory implies that he is a pushover when it comes to standing up for himself against drunken troublemakers at a local pub. So Tom makes up for the ego teardown by being pushy towards the new lady he is trying to woo. Whatever Lucy suggests, Tom does the opposite, if he even listens to her at all. While trapped and terrified, Tom’s bright suggestion is to play a dumb either/or game, not to calm Lucy down or to distract her, but just because. And when it seems like Tom cannot possibly regress into any more of a jerk, he pulls out a bottle of alcohol and starts chugging. Yeah, great way to impress the new lady. Aspiring cinematographers take note: This is how not to shoot scenes through windshields. With just one small tweak to the script, “In Fear” could have easily changed this into a favorable dynamic. Tom and Lucy’s plight would be heartbreaking if they were an endearing couple instead of a mismatched one. It would have been a simple matter to make Tom awkwardly sweet, depicting him as nervously fretting over his romantic getaway plans going up in unlucky smoke, apologizing profusely, and worrying about how to make it up to the new object of his affection. Or, if story creators Jon Croker and Jeremy Lovering really had their hearts set on a bickering lead couple with no romantic chemistry, why not make them a husband and wife struggling to save their marriage on a last ditch outing to rekindle their love? Maybe that is clichéd, but at least it would add some justification to their ridiculous behavior. Midway through the movie, Tom and Lucy pick up a mystery passenger whose true motive is only a mystery to Tom and Lucy. Max rivals Tom in the overbearing a-hole department, which is only one of several red flags Max walks onscreen with. Yet Tom and Lucy are too dimwitted to do anything that would make sense, and that includes noticing the danger they willingly welcome into their car. With masked men chasing them, personal items going missing before strangely reappearing in the road, and hands attempting to pull them into the darkness, Tom and Lucy still take any opportunity that comes their way to get out of the car and wander a dark forest. And when they wander together, of course they drift far enough away from each other that one of them can be silently abducted without the other person noticing a thing. Their predicament is moderately absurd to begin with. I get that this hotel is tucked away in a wooded hillside, but exactly how far off the beaten path is it that these two never get a sense of direction no matter how many wrong turns they make? You would think that at least once when they passed a familiar landmark for the umpteenth time, one of them might have said, “hey look, there’s that fence with the ‘no trespassing’ sign on it again. We went right last time, so let’s try left on this go.” A small dollop of deductive reasoning and this problem is solved. But there is no greater problem for “In Fear” than the one it has with its unlikable personalities. Bret Easton Ellis would have a hard time intentionally creating more contemptible people than Max and especially Tom. Being trapped on an isolated country road surrounded by darkness with these fellows is a horror story indeed. Being stuck with them for an hour and half in this movie is even worse. March 3, 2014 by Ian Sedensky.